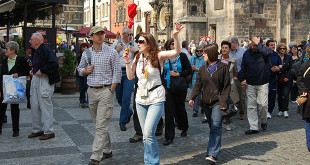 Old Town Square (Staromestske namesti) – Prague’s centre for cafes, street entertainment and leisurely fun. Very beautiful historical buildings surround the square. Part of square is Astronomical Clock, watch Christ and his Twelve Apostles when the clock signal hour. The first figure to emerge is that of a skeleton, representing Death, followed by the Twelve Apostles. Charles Bridge (Karluv most) – The bridge with the best night view of Prague Castle. It is one of the most popular sights. Romantic spot as well. Prague Castle (Prazsky hrad) – The complex is a magnificent experience throughout, with St. Vitus cathedral and several museums each worthy of hours of exploration. Worth to see is also Kafka’s house in Golden Lane. Best way is to use tram 22 or 23 on its scenic journey through the Malá Strana and up to Hradčany, from where you can easily enter the castle. Municipal House (Obecni dum) and Smetana Hall – It is Prague’s most prominent Art Nouveau building, cultural centre with exhibition halls and auditorium. The Smetana Hall on the first floor is the city’s largest concert hall and is where the opening concert of the Prague Spring Music Festival is held each year. 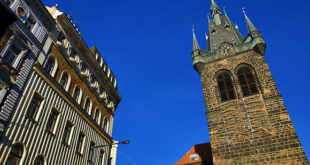 Wenceslas Square (Vaclavske Namesti) – The largest and busiest shopping street in Prague. Many times in the history demonstrating Praguers gathered here. The Estates Theatre (Stavovske Divadlo) – Prague’s oldest theatre is worth visiting for good performances and its architecture alone. The Estates Theatre hosted the première of Mozart’s Don Giovanni in 1787 and this opera can still be seen here today. Old Jewish Quarter – Small cobbled streets, home of the mythical Golem, the oldest Jewish synagogues, and the famous cemetery. St. Vitus Cathedral – Located at Prague Castle complex – numerous beautiful cathedral’s chapel. French Gothic structure. Magic Lantern Theatre – Known for its modern and controversial glass design and venue for all Magic Lantern shows. Situated directly next to the National Theatre. Christmas Markets – in December visit fabulous markets and feel real Christmas atmosphere. Mucha Museum – Fascinating and world’s first Mucha Museum. Krizikova Fountain – great water and light show, quite unique in the world. Cafe Imperial – Habsburg-era cafe with stunning 1914 ceramic tiled interior. Bertramka – Villa where Mozart stayed while visiting Prague in 1787 and 1791, now museum and concert hall. Trade Fair Palace – Gallery of modern art (Veletrzni Palac). St. Nicholas Church – Experience the theatre of the High Baroque in this landmark of Lesser Town. National Theatre – The national symbol of Czech culture and independence in neo-renaissance style. Next to the Vltava river. Observation Tower – For the best view of Prague, this building is a small version of the Eiffel tower and sits on top of Petrin hill. 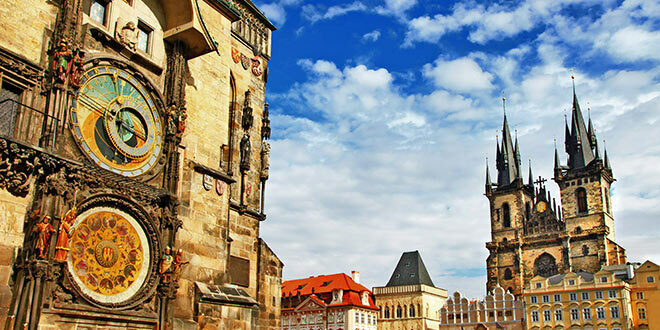 Old Town Bridge Tower – For the best view of the Vltava River and Charles bridge. Looking the other way, view of Old Town. Parizska Street – The street to be seen on, for the famous and glamorous. Loads of posh shops and cafes. Petrin Hill – Dominating the skyline of Prague this park is the largest area of trees and fields in the immediate vicinity of Prague. Miniature of Eiffel Tower. Astronomical Tower – The central tower of the former Jesuit College allows access to a frescoed Baroque library and the best viewing gallery in the Old Town. Powder Tower (Powder Gate) – For those visitors energetic enough for a climb to the top, this Gothic tower has an amazing view of Prague. Prague State Opera House – This opera house presents performances from the Italian repertoire: Rossini, Verdi, etc. and selected others. Rudolfinum – Venue for the best classical music in Prague as well as selected exhibitions. Overlooks the Vltava River. Lesser Town – Across the Vltava River via the Charles Bridge, nestling below the castle, is the Lesser Town quarter of Prague, known as “Mala Strana” in Czech. Lapidarium – Branch of National Gallery showing some great Czech sculptures. Loreta – Important baroque place of Christian pilgrimage. St. James Church – An attractive Baroque reworking of a gothic church and originally the Presbytery of a Minorite monastery. Strahov Monastery – Great place to see a unique baroque library, Strahov Picture Gallery, Museum of Miniature and two churches of Premonstratensian order. Stromovka Park & Vystaviste – Off the beaten track (a small distance to travel from the centre) but especially worth a visit in the Summer time. Vltava River – The big river which twists its’ way through Prague and various other towns in the Czech Republic. Vysehrad – Vysehrad is a little out of the way and perhaps, unjustly, for this reason is not visited as much as it should be. Lennon Wall – Graffiti painted wall. Dancing House – Try to imagine architecture style of building. Old Town – Many tourist attractions are located there. Wallenstedin Palace Gardens – The palace’s cavernous former Jizdarna, or riding school, now host occasional art exhibitions. Prague Television Tower (216m high) the tallest building in Prague, was opened in the year 1992. High speed lifts take you to the restaurant and cafe or to the lookout gallery form where you can see magnificent view of Prague.